Asia’s leading Health & Beauty retailer, Watsons Malaysia engaged Leona Chin, Malaysia’s Drift Queen in a Watsons Drift with Leona campaign in conjunction with Grand Prix season in March. Being a leader in this industry, Watsons wants to bring and reward their members with the ride of their lifetime. 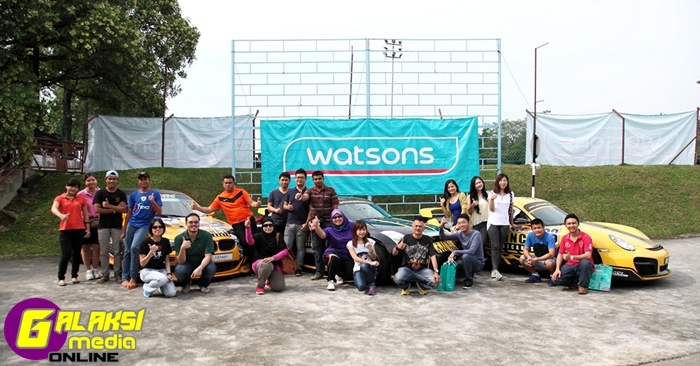 Watsons VIP members that purchased RM150 in a single receipt during 6 till 31 March 2014 were given an automatic entry to be in a running to win a Drift with Leona experience. Apart from the entry, they were also given a free Racing Car USB Pen Drive 8GB (worth RM49.90). “Our vision is to become the ultimate retailer for shoppers by providing exclusivity and members can’t buy experience. Ultimately we would like to increase the men shoppers during this racing season and to encourage them to take care of their wellbeing. With this vision, we engaged the best female drifter to bring them on a ride of their lifetime” mentioned Jessica Ng, Watsons Malaysia Marketing & Development Director during the start of the campaign. During the campaign period, members get to enjoy exclusive promotions starting from RM1 with purchase and up to 5x points on selected products. The 60 invited members who attended the final ‘Drift with Leona’ event were treated with a spectacular speed experience. They had to go through an exciting Time Attack Go-Kart challenge and at the end the top 10 fastest drivers get to experience the drift with Leona Chin in her Nissan 350z. “Leona personifies the qualities of the brand – versatility and beauty. She has multiple experiences not only in drifting but rally, Gymkhana, circuit racing just to name a few. With the growing numbers of members, it is important to bring engagement to Watsons members. We provide members the best from each field and tailor-made these experiences to cater to member’s interest,” mentioned Kulvinder Birring, Managing Director of Watsons Malaysia & Indonesia during the event. Watsons recently ran many exciting campaigns such as Win RM1,000 Touch ‘n Go reload, 5% rebate with every RM100 reload, first ever health related event – Move Your Body, guest appearance on Astro Supersports & Astro Arena and not forgetting the recent win a trip to Brazil for 2 to watch 2014 FIFA World Cup™ Grand Opening & Opening Match with Johnson & Johnson. For more information and upcoming promotion on Watsons, please visit www.facebook.com/watsonsmalaysia or Watsons’ official website www.watsons.com.my. Don’t forget to ‘Like’ our facebook page!